If you like playing or watching team sports, you’ll probably find this AI’s latest creation fascinating. 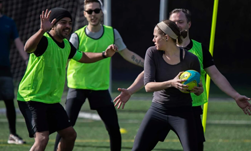 Developers from AKQA, a global innovation agency most known for working with some of the hottest brands and public figures, trained a recurrent neural network and a deep convolutional generative adversarial network on over 400 sports with the aim of creating a new and original sport. Picture Rugby, Soccer, sprinkled with a little football, and marinated with some field hockey, scrambled all into one sport, you get Speedgate. Using NVIDIA Tesla GPUs for both training their neural networks and inference, the models generated over 1,000 different sport concept outputs, rules and gameplay outputs. And besides generated the new sport, they also trained their neural network on 10,400 logos to come up with their official Speedgate logo. Many of the sports included descriptions such as “underwater parkour,” or an exploding Frisbee game. Another one dared players to pass a ball back-and-forth while standing on a tightrope in a hot air balloon. Sound interesting? 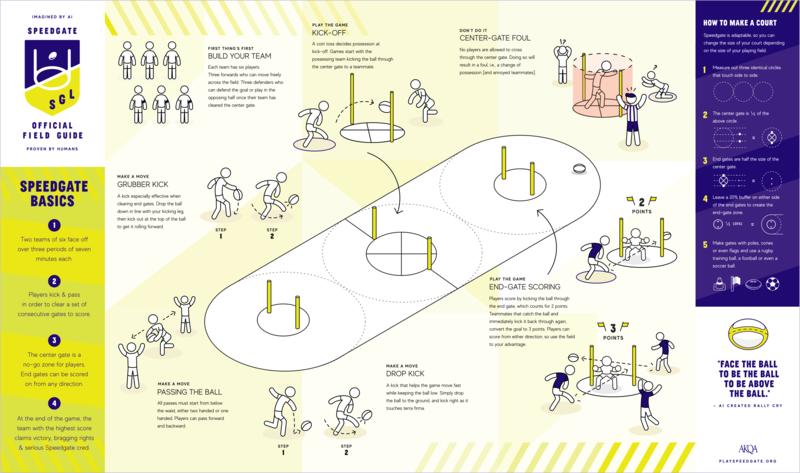 The AKQA team thought so too, and after a thorough back and forth process, the developers narrowed the list down to three sports for a real-life test. The rules are simple, players team up in two groups of six, and try to kick or pass the ball into a gate at either end of the field. To do so, they need to keep the ball moving every three seconds. However, they cannot cross a circle in the middle of the field. Teams can either get two points by kicking the ball through the gates at either end and three points for ricocheting the ball through the gate. Interested in playing? The company published the rules of the game along with instructions on how you can start your own league. “Using AI as a member of a creative team takes us to a new place, that we never could have gotten to without it,” mentioned Whitney Jenkins, Creative Director at the agency.